I must ask where you got your glass for your shake from. It’s absolutely beautiful. Well I had to ask my wife on this one, as they’ve been in her family for years. She suspects they’re an heirloom from the 50’s or 60’s. The base & handle are made of pewter, and they each have a varied design. Thanks for asking? I was just looking for a new smoothie recipe where I could incorporate my “greens” powder!! Thanks you have incredible timing!! That’s a great idea to prep all the fruit earlier on the week! Sounds like a delicious shake- which I would sub rice or almond milk & hemp protein for a vegan version. Am definitely intrigued by the wheat germ. Thanks VKO, for providing some vegan alternatives to the recipe… I’m going to pass this on to my niece ! 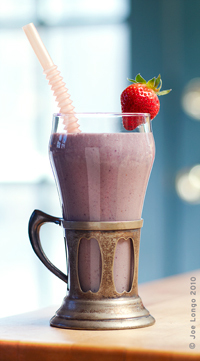 The flax oil also helps make for a smoother shake! Wow, this sounds fantastic. Can’t wait to try it. Sounds great, I will have to work it into my diet. Thanks Joe, this sounds like a good healthy breakfast choice for me! !